Through a new menu option is now possible to open a pdf file or an ico file. After the file is opened the document will be scanned and then will be shown, though a dialog window, a rappresentation of each page as element on a list. Each page of the list contains some informations like page number, pixel size, resolution, depth in bits and them can be checked in order to be imported in the main window of the program. From there, you can use the classic options and features to convert and apply transformations to the imported pages of the document. Notice that to convert more than one page you need to set the correct renaming options. You can check the video below to see how to convert a PDF file into a bunch of images. 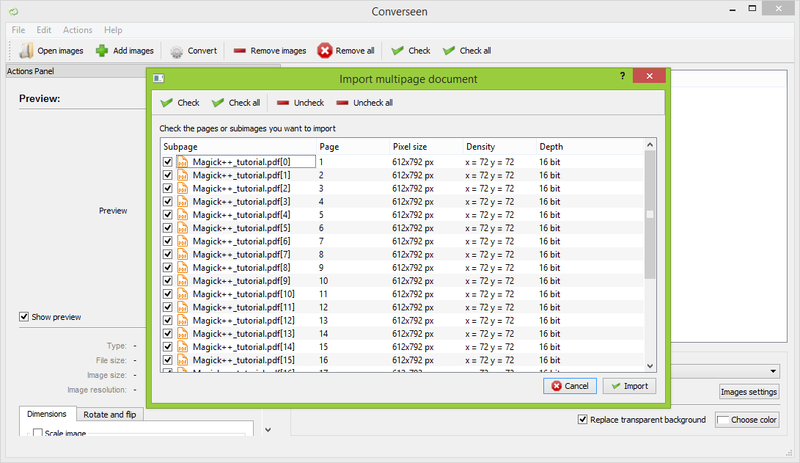 You can download Converseen for Windows and Linux from here.